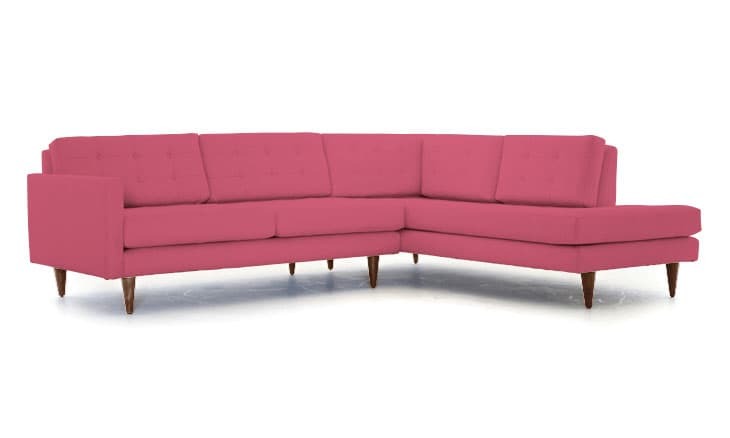 AS YOU MAY KNOW – I JUST GOT MY PINK SOFA. IS A FUN problem to have – BUT OFTEN DAUNTING TASK! 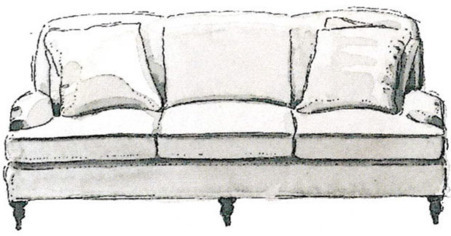 HERE ARE 10 THINGS TO CONSIDER WHEN CHOOSING A SOFA. I HAVE YET TO DO ANYTHING TO THE ROOM WITH THE SOFA BUT JUST YOU WAIT UNTIL MARCH!!!! LOCATION /ROOM SIZE – WHERE IS IT GOING AND WITH WHAT? MY OLD COUNTRY HOUSE LIVING ROOM – THE BLUE SOFA ON THE LEFT IS SLIP COVERED! 1. LOCATION / ROOM SIZE, LAYOUT, DOOR AND WINDOW LOCATIONS, other furniture and AND FLOOR PLAN ALL PLAY A HUGE PART IS DECIDING WHICH OF THE SEEMINGLY MILLIONS OF SOFAS TO PURCHASE. 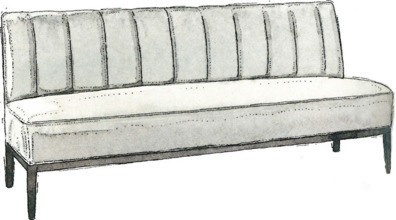 SOME QUESTIONS TO ASK YOURSELF : WHERE IS THIS SOFA GOING? 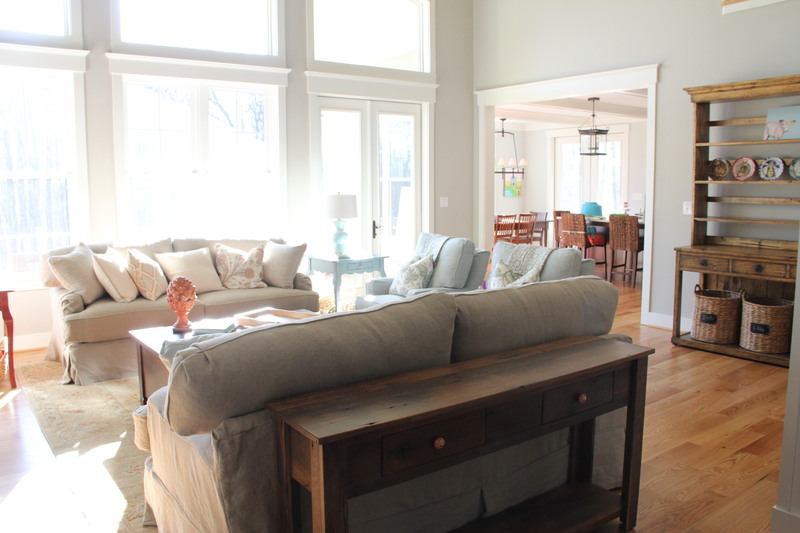 IS IT GOING TO BE ….IN THE FAMILY ROOM, LIVING ROOM, AND HOW MUCH TRAFFIC WILL IT NEED TO WITHSTAND? 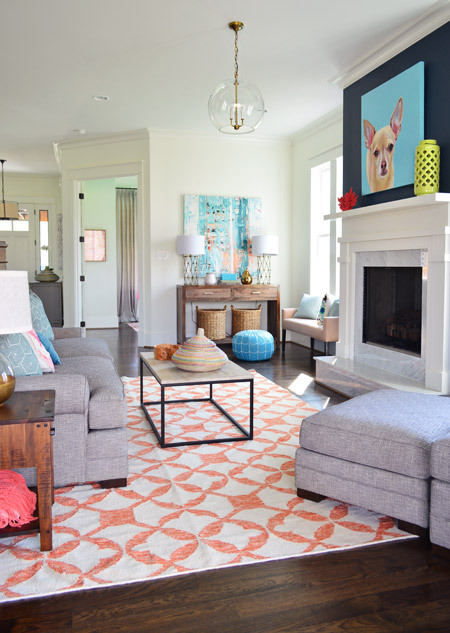 YOUNG HOUSE LOVE HOMEARAMA SHOWHOUSE – AND MY PORTRAIT OF BURGER! WHAT ARE THE AGES OF THE PEOPLE (AND PETS) WHO WILL USE IT MOST? 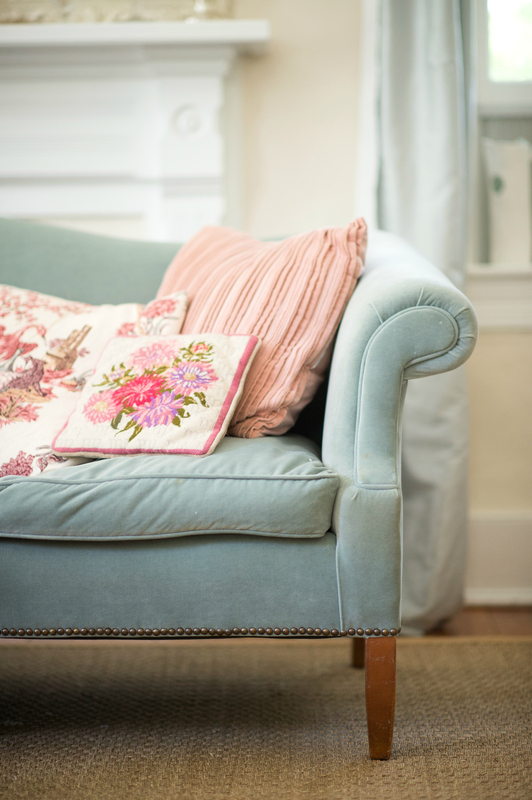 I remember watching as my toddler wiped her runny nose on the sofa cushions edge – which came conveniently to nose-height – and it was a blessing that those cushions could be laundered! CONFIGURATION – DOES YOUR ROOM HAVE 4 WALLS? OR AN OPEN FLOOR PLAN? WILL THE BACK OF THE SOFA BE VISIBLE? WHERE IS THE LIGHTING IN THE ROOM? IS THIS ROOM THE CENTER OF THE HOUSE…OF DOWN IN THE BASEMENT? THIS IS AN OLD PHOTO I FOUND ON PINTEREST WITH A DEAD END LINK. IT IS PROBABLY ONE OF MY FAVORITE PHOTOS OF ANY SPACE. 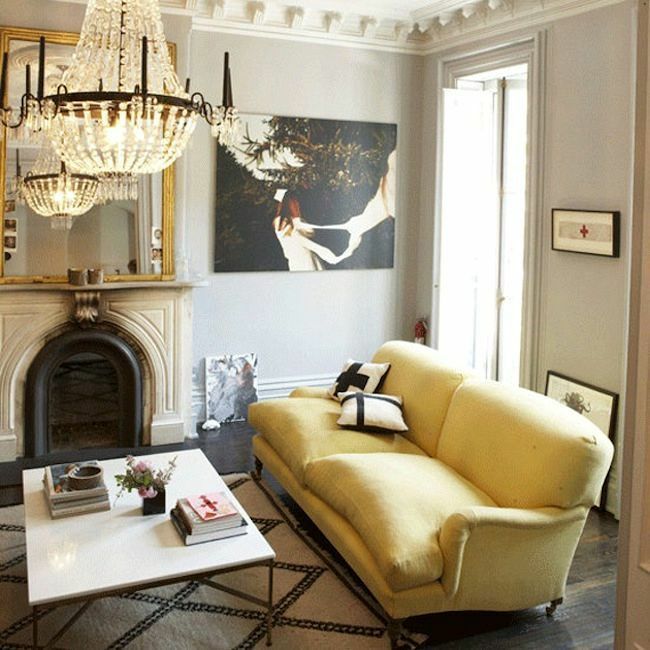 IT EPITOMIZES MY DESIGN TASTE – and I would give ANYTHING TO FIND THOSE LAMPS!!!!!! ALL IMPORTANT QUESTIONS TO ASK YOURSELF BEFORE YOU MAKE THE PURCHASE….AND FOR PETE’S SAKE – MEASURE YOUR DOORWAYS AND STAIRCASES!!! 3. BUDGET. BUDGETS AND TASTES VARY AND CAN DICTATE OPTIONS. BUT NOWADAYS – A TIGHT BUDGET IS NOT A BARRIER TO STYLE. 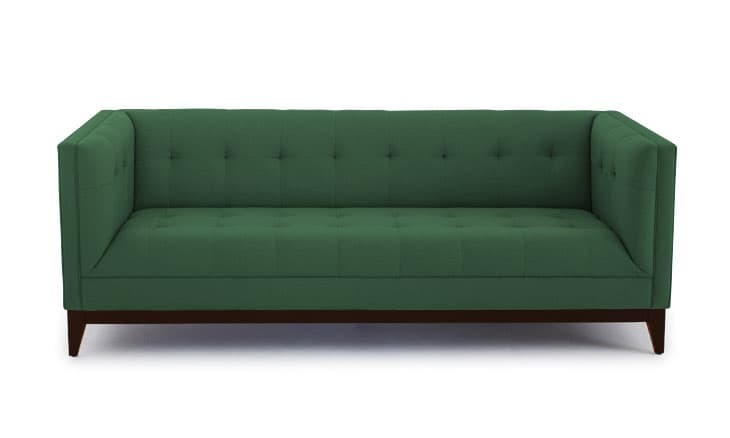 EMILY HENDERSON DID A GREAT “SOFA” POST WHICH INCLUDES AMONG OTHER VALUABLE ADVICE ” GENERIC SOFAS NOT TO BUY” AND A FEW DOZEN GREAT SOFAS UNDER $1000!!!! 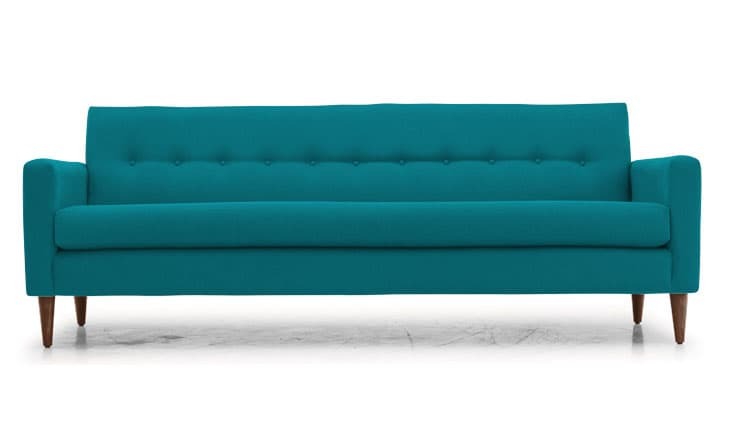 THERE ARE SOFAS FOR EVERY BUDGET AND EVERY WEBSITE HAS SALES! WATCH FOR DISCOUNTS…AND COUPONS AND MARKDOWNS. 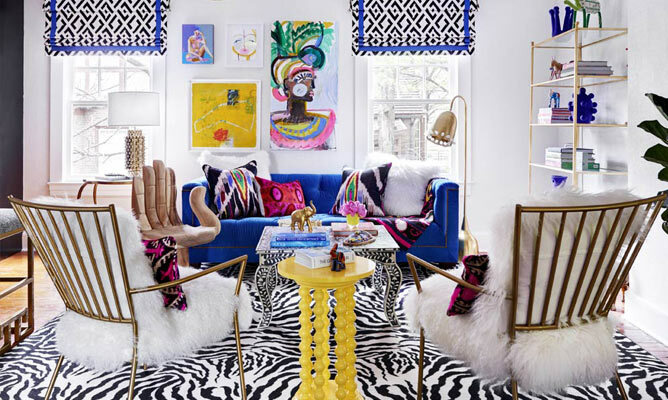 THE DOMINO BOOK IS HANDS DOWN MY GO-TO FAVORITE DECORATING AND DESIGN BOOK !!! HANDS DOWN THE BEST RESOURCE BOOK EVER! Streamlined and unfussy, like an elongated slipper chair, this option is made more for entertaining than lounging. Usually lean and open, it does well in small spaces. Rumpled, yet aristocratic, this British country-house staple has soft, deep cushions and low arms that make it ideal for TV watching. Often seen in a Louis XIV style, this regal option is delicate, formal, and architectural. 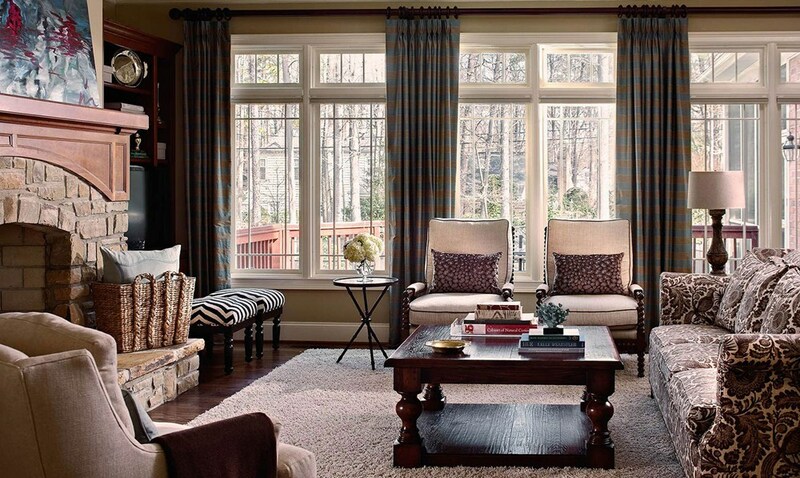 The exposed carved-wood frame provides a structured contrast in a room of heavily upholstered pieces. TUXEDO- A signature of society decorator Billy Baldwin, this sofa is luxurious yet decidedly no-frills. A straight profile (the arms and back are the same height) give it a more masculine feel. Works in any room, modern or traditional. More sculpture than sofa (this one is a mid-century design by Vladimir Kagan). This piece can float in the middle of a room. This 19th century English design features tight tailoring, a high back, rolled arms and tufting. In leather, it’s clubby and masculine. Casual, with a ’70’s lounginess. Good for establishing a sitting area in a loft. Minimizes the need for other seating. A version with legs cuts the bulkiness. This style is named after a grand house of King Henry VIII. Super-classic and formal, but very cozy and sheltering. 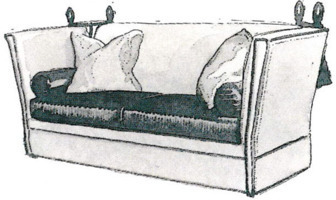 Hinged sides untie and drop flat so you can lie down. Dating back to the 18th-century British designer Thomas Chippendale, this piece has an old-world sophistication but also looks surprisingly modern in a solid linen fabric. SKIRTED OR UNSKIRTED. …HERE ARE some TO MUDDLE THROUGH! 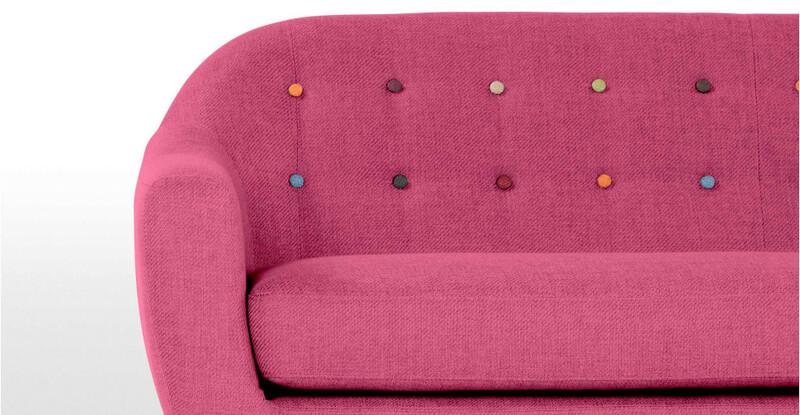 MADE.COM RITCHIE SOFA WITH COLORED BUTTONS – DROOL!!! 5. 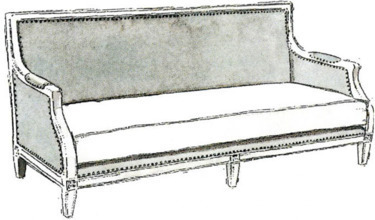 SEATS, CUSHIONS – NUMBER – HOW MANY??? DO YOU WANT ONE BENCH SEAT CUSHION, TWO CUSHIONS OR THREE…AND WOULD YOU LIKE “T” OR AN “L” CUSHION OR A “SQUARE/RECTANGLE” STYLE? WHO KNEW IT COULD BE SO COMPLICATED. “L” AND “T” CUSHIONS WRAP AROUND THE ARM OF THE SOFA. PLUM AND BOW “ANNETTE” MAROON SOFA FROM URBAN OUTFITTERS $798 MODERN SCRILL ARM WITH 3 SEATS AND 2 PILLOWS WITH BUTTONS. 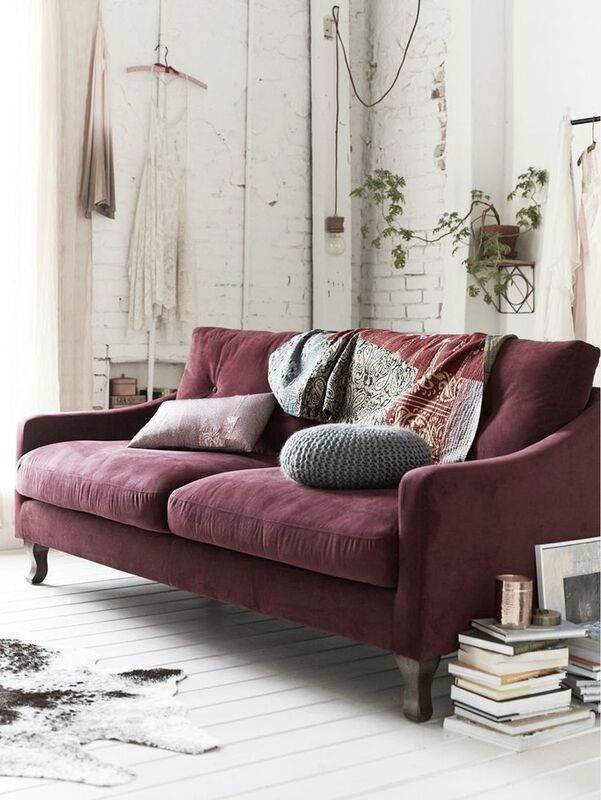 THE ANTHROPOLOGIE 89″ WILLHOUGHBY SOFA IN ROSEWOOD SLUB VELVET – OTHERWISE KNOWN AS MY SOFA!!!!!!!!! 7. 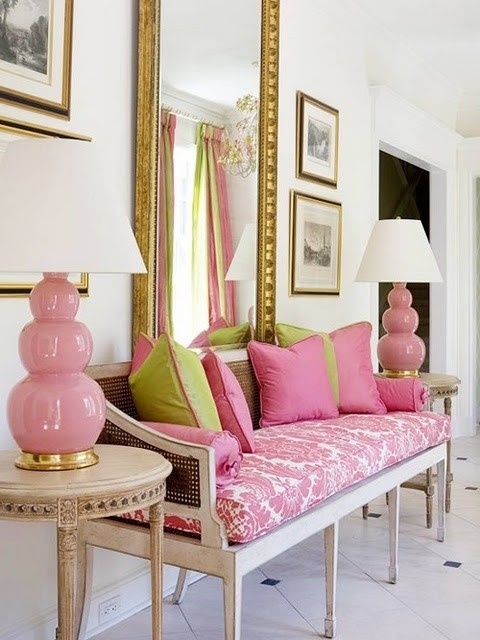 SKIRTED OR VISIBLE LEGS, – I LIKE A MIXTURE OF BOTH ….LEGS ARE CONSIDERED A BIT MORE DRESSY…BUT LOVELY SKIRTED ONES ARE BEAUTIFUL TOO….DESIGNER TRACI ZELLER HAS A RULE OF THUMB THAT IF THE SOFAS ARE SKIRTED SHE SELECTS MORE LEGGY TABLES…. DON’T EVEN GET ME STARTED ON THE DIFFERENT CONFIGURATIONS THERE ARE KICK PLEATS, DRESSMAKER PLEATS, EVEN RUFFLES…YOU CAN CAVE MULTIPLE PLEATS, JUST CORNER PLEATS…OR A CENTER PLEAT…!!!!! 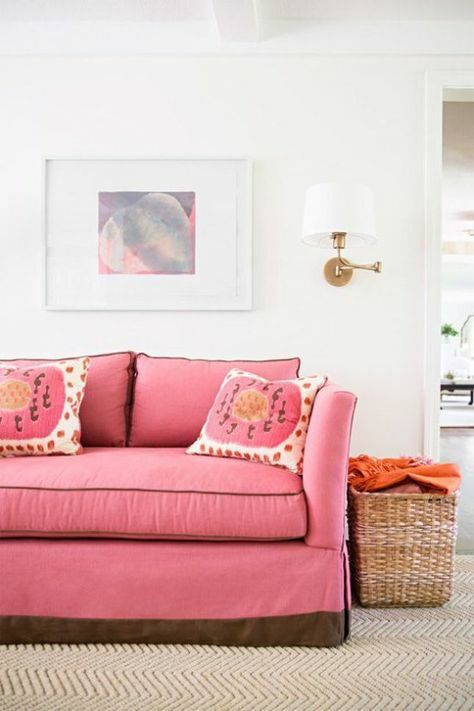 IN OTHER CASES, YOU CONSIDER THIS SOFA TO BE AN INVESTMENT, WORTHY OF EXTENDING YOUR BUDGET TO ACCOMODATE A PIECE OF FURNITURE THAT IS NOT ONLY WELL MADE AND STURDY, BUT CLASSIC VS TRENDY, WITH A TRADITIONALLY INSPIRED FRAME AND LINES, IN FABRICS WHICH ARE TIMELESS AND HOLD UP TO HEAVY WEAR. 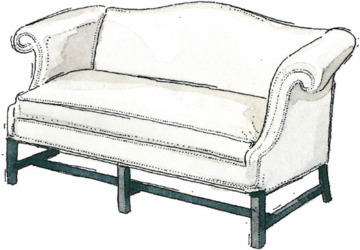 RESTORATION HARDWARE – BELGIAN LINEN SLOPE ARM SOFA – SINGLE CUSHION, SKIRTED AND SLIPCOVERED! 9. 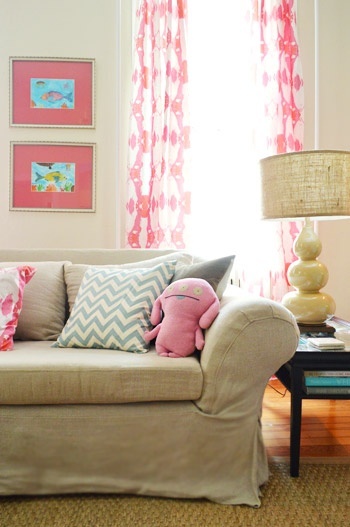 COLOR/ FABRIC – AGAIN THIS IS NOT ALWAYS SOMETHING YOU HAVE LOTS OF FLEXIBILITY ON…BUT WILL THE SOFA BE YOUR POP OF COLOR? 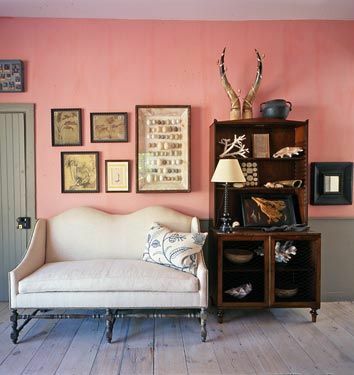 OR WILL IT SERVE AS A BACKDROP TO ALL OF THE OTHER COLORS IN THE ROOM – WITH ART, RUGS AND OTHER PIECES TAKING FOCUS? PINK YUMMY – NYLON PINKSY- CONTRASTING PIPING ADDS WHIMSY AND STYLE…LOVE THE BROWN AND PINK!! 10. 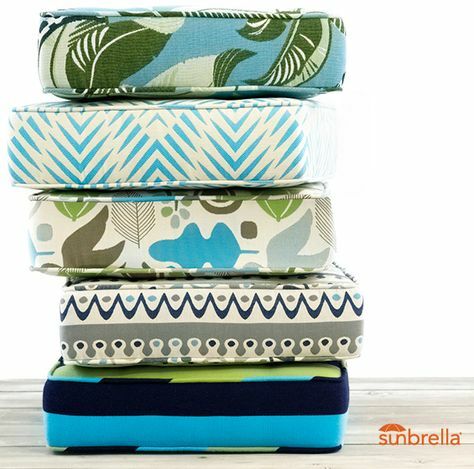 SLIPCOVERED VS UPHOLSTERED – I REFUSE TO BELIEVE THAT THE ONLY OPTION FOR YOUNG CHILDREN IS LEATHER… THERE AND SO MANY DURABLE FABRICS OUT THERE AND SUNBRELLA MAKES INCREDIBLE INDOOR OUTDOOR OPTIONS THAT THE POSSIBITIES ARE ENDLESS.AND I LOVE SLIPCOVERS!!! AND FOR PETES SAKE – HAVE SOME FUN! BUT ISN’T IT BETTER TO CONSIDER ALL OF THE OPTIONS? I THINK SO, EVEN IF IT TAKES A LITTLE MORE TIME. EMILY HENDERSON’S THEORY AS TO WHY SO MANY “MISTAKE” SOFAS GET PURCHASED IS BECAUSE THEY ARE 1. IMMEDIATELY AVAILABLE AND 2. 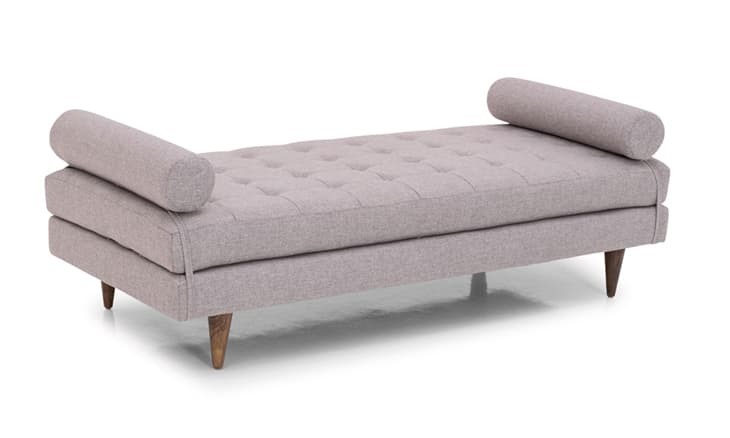 INEXPENSIVE...BUT SHE AND I HAVE FOUND IS THAT IF YOU SHOP AROUND YOU CAN GET A GREAT SOFA FOR A DECENT PRICE…AND ONE YOU ACTUALLY LIKE – NOT SETTLE FOR!!! 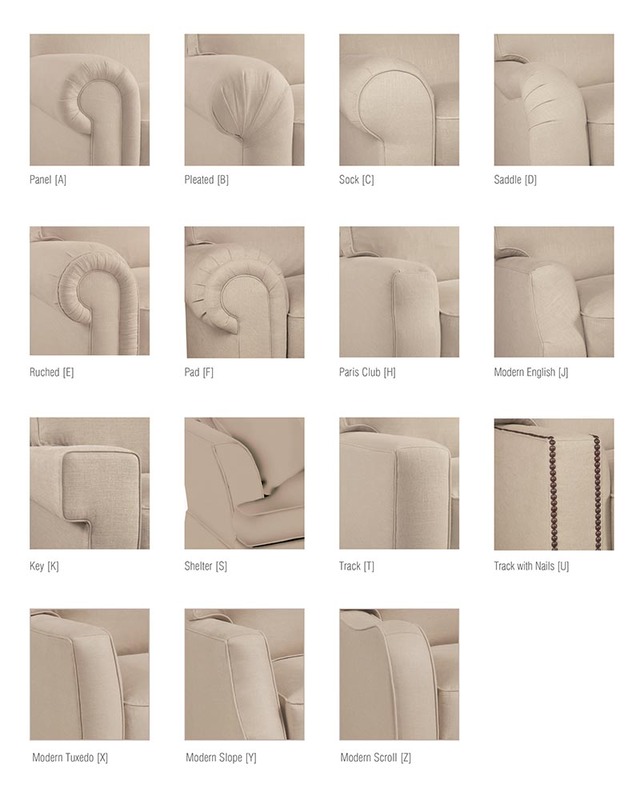 SO HOW DO YOU CHOOSE A SOFA? WITH SO MANY CHOICES? AND SO FEW DECENT PLACES TO GO SHOP AROUND WITHOUT LOSING YOUR MIND? MY SUGGESTION IS TO VISIT SITES LIKE PINTEREST, HOUZZ AND THERE ARE SO MANY GOOD ONES THAT FEATURE LOTS OF HOMES -…. I LIKE EMILY HENDERSON, DESIGN CHIC, AND OTHER STYLIST, DECORATORS AND DESIGNERS – VISIT THEIR SITES AND JUST WANDER THROUGH THEIR ARCHIVES. 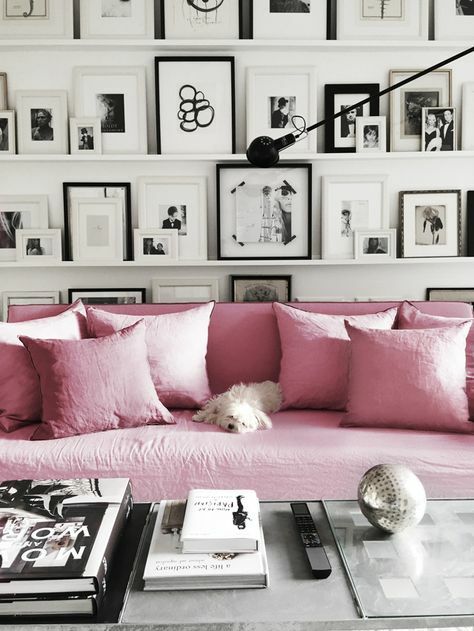 PIN THE PHOTOS THAT SPEAK TO YOU – COLLECT PICTURES OF SOFAS THAT YOU LIKE!!!! 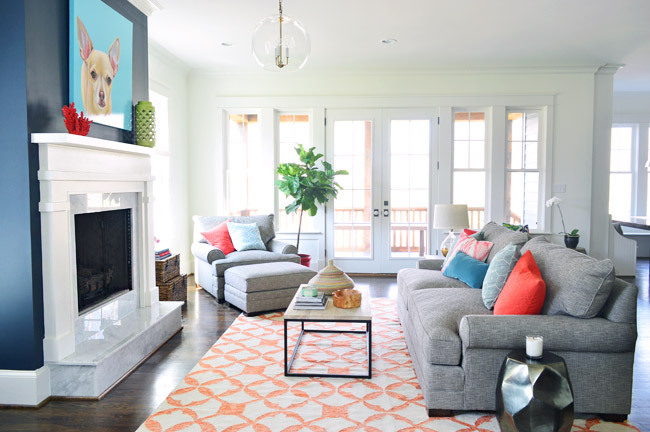 ONE OF MY PERSONAL FAVORITE “IDEA” RESOURCE IS THE BLOG HOUSE OF TURQUOISE – SHE FEATURES PRIMARILY DESIGNERS AND THE ROOMS AND HOMES THEY HAVE DESIGNED, SHE HAS THOUSANDS OF LIVING ROOMS FEATURED IN EVERY STYLE IMAGINABLE!!!!! DO YOU HAVE ANY SOFA STORIES???? DO YOU HAVE A FAVORITE STYLE?? HOW DID YOU CHOOSE YOUR SOFAS??? ONE OF MY FAVORITE PHOTOS AND SOFAS EVER! Love it! 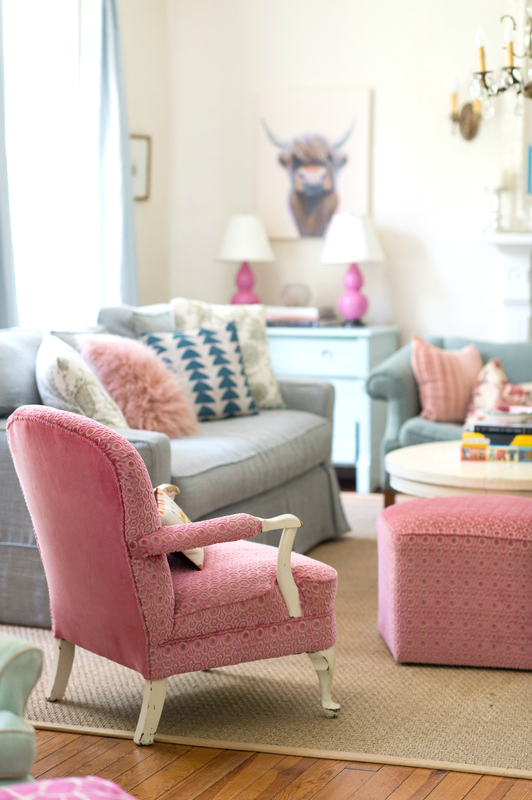 I have a cream colored sofa that we put a custom pink velvet slipcover on for the winter months. It’s a darker pink than yours–I think the color was called Honeysuckle. It makes me happy, too!